Watch the 2011 FIM Snowcross World Championship in Tuuri, Finland LIVE. Set your alarm for 3 a.m. CT, crack open a Monster Energy and watch the world’s top riders battle for the world title! Click HERE to download the detailed race schedule. Less than 24 hours after Tucker accepted his ISOC National Snocross Pro Points Championship trophies, Team 68 boarded a plane for Helsinki, Finland for the 2011 FIM Snowcross World Championship. Our flights went without a hitch and all of bags arrived safely – HUGE relief! We were immediately greeted by Mikko from SGN Group (Arctic Cat Finnish Distributor). He took us to the SGN warehouse where we were reunited with Tucker’s Euro-prepped Monster Energy/Arctic Cat which made the trip across the Atlantic three weeks earlier. The crew wasted no time and immediately uncrated the snowmobile. We were happy to see that all of our tools and supplies made the journey safely as well. After five hours of organizing, we loaded the sled and supplies into our mobile test facility – a spanking new Sprinter van. Thank you SGN Group! Tucker felt right at home. We met Raoul for dinner near our hotel. It was an exciting reunion full of stories and laughs. Wednesday morning we left bright and early for Pieti Puhakka’s test track. 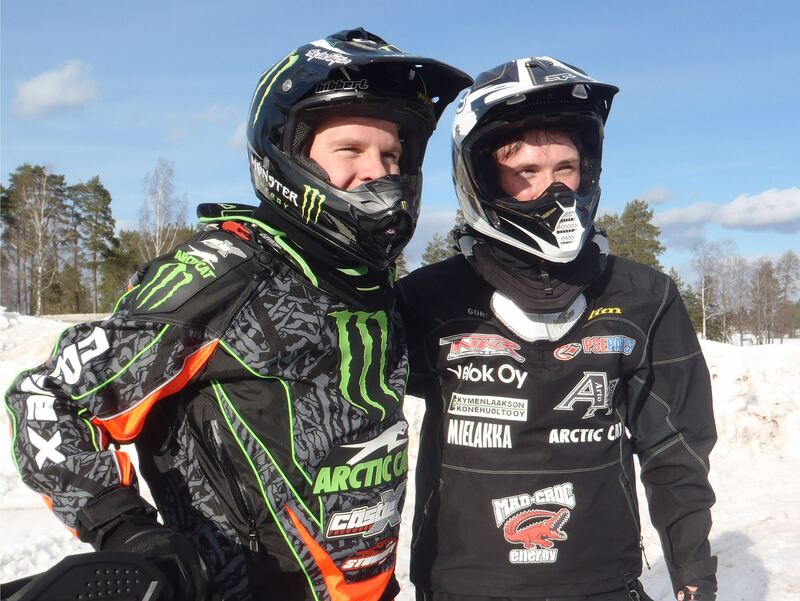 Pieti is a Team Arctic Finnish racer who was kind enough to invite us to ride with him. He has the perfect set-up with a test track, groomer and heated work shop. Pieit and Tucker spent the day riding and testing together. Click HERE to watch a short clip of them riding together. This year will be Pieti’s first World Championship so keep your eye on the no. 23 Arctic Cat in Tuuri! Thursday was the second and final day of testing at Pieti’s. The majority of the day was dedicated to starts and final tuning on Tucker’s sled. We arrived in Tuuri late Thursday night and were greeted by the Monster Energy Finland crew along with more people from SGN. Thank you for staying up to greet us! Today, Friday, is a big day full of appearances and interviews for Tucker with practice early evening. Much like our adventure in Sweden last year, it’s hard to find words that can describe the deep gratitude we have for the people who have helped us make this journey possible. We are truly blessed by this opportunity and have again made friends we will have for a lifetime. 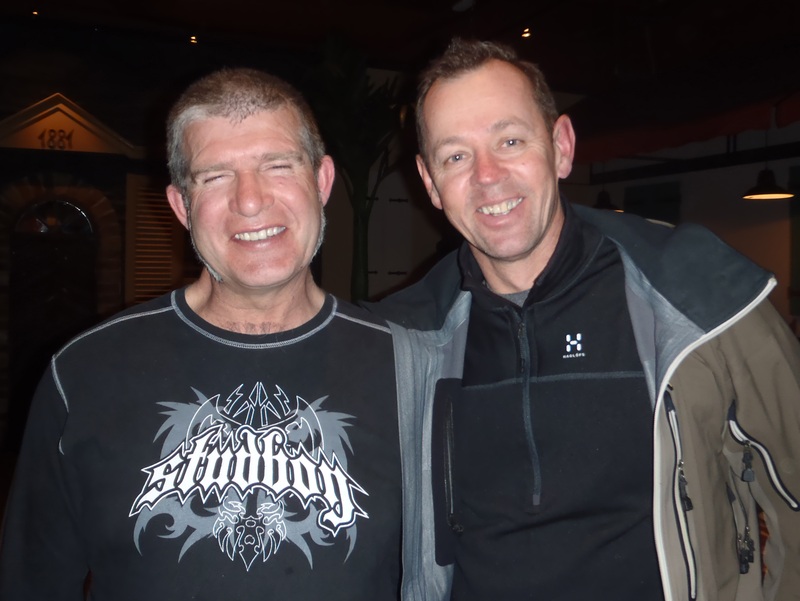 Kirk’s reunion with Raoul is a testament to this and encouragement that even after 20 years, we may all meet again! You can watch all of the racing action from Finland LIVE and free online! Below is the direct link. A detailed broadcast schedule with the time change will be posted soon. Watch Tucker’s Chase to the Championships LIVE! Watch all of the action unfold LIVE from the ISOC National Snocross Series Grand Finale in Lake Geneva, Wis. this weekend. Tucker enters the final stop of the tour with a 23-point lead in the Pro Open class and a 20-point lead in the Pro Super Stock class. Click HERE to watch the free, LIVE video stream! Looking for more? Follow the Tucker Hibbert Official Facebook Page for Trackside Videos and instant race results. Block off your Sunday afternoon to watch two races! VERSUS will broadcast the one-hour Michigan National at 3 p.m. ET. You don’t want to miss the intense coverage of the only indoor event of the season. At the same time, fire-up the live streaming from Elko Speedway on www.isocracing.com. You’ve worked hard all week, you deserve a break! Crack open a Monster Energy, put your feet up and take in some quality racing action! Fans have the opportunity to meet Tucker at two separate events tonight before racing action begins at Elko Speedway this weekend. What: Meet Hibbert, get an autographed poster, see his race-ready Arctic Cat Sno Pro 600 and walk away with a free Monster Energy drink! The snowmobile trail system leads right to the event. What: Autographs, freestyle show, games and music. Free with a weekend pass or $10.